This paper is based on the results of a research carried out during 2009 by AGTER as part of a broader CIFOR research, financed by a Rights and Resources Initiative project. The five-month fieldwork was carried out by Marta Fraticelli. It was presented by Marta Fraticelli and Michel Merlet during the Conference. « Taking stock of smallholder and community forestry: Where do we go from here? » IRD, CIFOR, CIRAD 24 - 26 March 2010 Montpellier, France. Forest clearing by cattle ranchers. Pando. 2009. © M.Merlet. 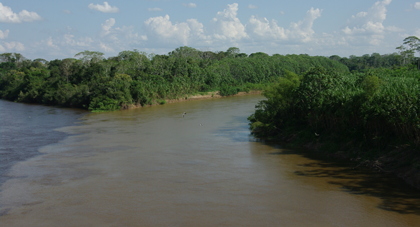 The Bolivian Amazon is an area of agricultural frontier where many actors – including rubber or Brazil nut companies, timber extractors, large scale cattle ranchers, traditional « extractivist » communities and peasants – try to consolidate by all means their rights over land and natural resources. 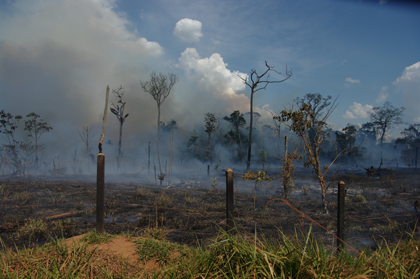 The question is: will Bolivian public policies be able to stop or revert land and natural resources concentration processes as well as to limit the destruction of Amazonian ecosystems? This paper studies the evolution of land tenure, the transformation of natural resources management rules, and the setting-up of property rights in recently created small-farmers communities in Pando, where individual and collective strategies for land and forest appropriation coexist. The conceptual framework for the research considers overlapping of various rights belonging to different actors as well as recognition of the contradictory and progressive character of their construction. The study confirmed the existence of a double process for creation of rights: one from below, within customs and local power relationships, and another one from above, with the attribution of rights by the State. While Communitarian Agrarian Reform Policy and Forest Policy under present Bolivian Government determine who has legal rights over land and natural resources, local conflicts, gathering and production systems specificities and contradictions between legitimacy and legality are making things evolve contrary to what was expected. Forest resources conservation and sustainability of agrarian rights redistribution to family farmers are threatened by ambiguous laws, which make use of inadequate concepts, as well as by the absence of mechanisms of capacity building in governance issues.